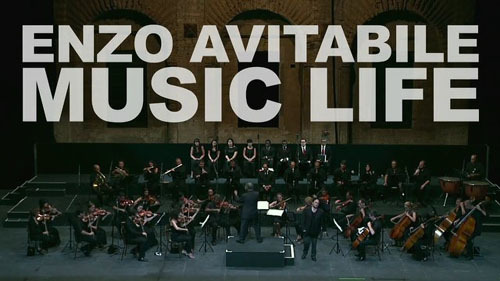 Review: Enzo Avitabile Music Life / It's Just Movies Review: "Enzo Avitabile Music Life"
So often there are docs about musicians with frustratingly little of their music to demonstrate why a film was made about them in the first place. But it isn’t this way with “Enzo.” This portrait film of his musical gifts is more like going to an actual concert interspersed with short bits of narrative from Enzo’s daily life in Naples. Enzo is a master musician/composer whose most startling contribution is fusing together a variety of musical genres with ancient instruments. Sometimes, he plays a replication of a small 900-year-old six-string harp that he had a hand in constructing. In a grand sequence, he picks up a sax, the instrument he is best known for, and lovingly brings its sound to fullness like a long lost love. The film starts out at Enzo’s small, cluttered apartment, from which we are chauffeured to a hall of delicate acoustics with Middle Eastern carpets juxtaposed on the floor. 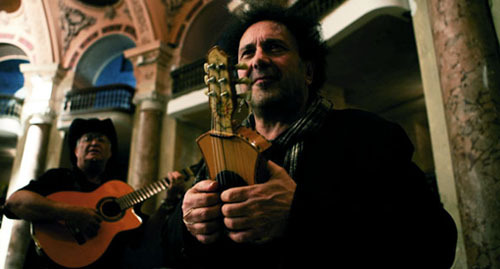 Eliades Ochoa, a 67-year old master Cuban guitarist, places himself across from Enzo and the two, without music notes, begin to play very simply, singing alternately, “The tears of a child sadden me. I can’t stand to see them cry. Tears from children hurt me, I just can’t bear to see them cry. Their smiles bring us joy. Every child deserves protection.” Their duet grows increasingly complex until miraculously they end together at the same millisecond in a final note. The lyrics are the Enzo stamp – always meaningful and always global. His words embrace a wide spectrum of protectionist pleas, pinpointing our universal responsibility, while reflecting through both music and words a diversity – a diversity of instruments, sounds, notes and artists that unite in the sound of one human race. A favorite segment of the film includes Enzo, percussionists, ancient instruments and a magically talented Ashraf Sharif Khan Poonchwala on a sitar. The blending of tones and the descriptive words, “The moon, moon dizzy from twilight, open – open up – it’s good for you at an ancient dance” haunt and beguile the listener in a crescendo-ing appreciation for Enzo’s fusion of cultures and message of one world. Cast: Enzo Avitabile with great artists from around the world: Eliades Ochoa, Naseer Shamma, Gerardo Nunez, Ashraf Sharif Shan Poonchwala, Trilok Gurtu, Luigi Lai, Zi’ Giannino Del Sorbo, Amal Murkus, Trio Drivan Gasparyan, Hossein Alizadeh, Daby Toure and Bruno Canino. Producers: Shane Bissett and Angelo Russo Russelli (execs), Davide Azzolini, Jonathan Demme with Antonio Monda (co-producer). There are a list of works – my fav is #6. If you think there’s a better one – enter the link (and # if needed) here so we can check it out. No, I don’t know Italian so I am hoping the lyrics are always about peaceful co-existance.